I drove Ayrton Senna's legendary McLaren MP4/4. The car he drove to victory in the 1988 Formula One World Championship. Ok. Let me just clarify. I didn't actually drive the real car. I drove the virtual car on the online racing simulator, Simraceway. The virtual car will be released today but I got the first chance to drive and who says no to an opportunity like that? Now before you boo me and call for false advertising, virtual racing simulators can be extremely accurate. The physics and car models are derived from drivers who have actually driven the real things. SimRaceway, for example, has Dario Franchitti, Alan McNish and many other top racers helping to make the experience as realistic as possible. Simply put, a good racing sim can be a great indication of what it is like to drive the real thing. Simraceway is new and goes up against the big dogs in the online racing world, such as iRacing and rFactor. 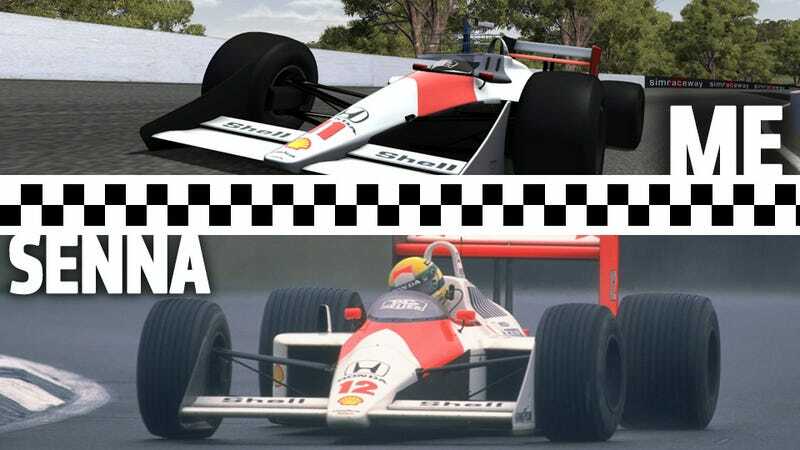 When the opportunity arose for me to drive Senna's McLaren, prior to the cars' Simraceway release, I took it. This is one of the all time great F1 cars. It won 15 of the 16 races in the 1988 season, with Senna and his teammate Alain Prost behind the wheel. So what was it like to drive the McLaren MP4/4 in the virtual world? Well, when driving on an online sim, despite the surprisingly realistic physics, you lack the sensation of movement in the car. And by movement I don't mean forward propulsion, rather the seat of your pants movement that you get when actually driving. You feel the cars' impulses and reactions pulsating through your whole body. You become one with the car. In a game, you don't. No matter how good it is. So if we realize the game's natural limitations and focus on what it can do (which is provide lifelike sounds, visuals, handling characteristics, grip and more) you can still get a pretty clear idea of how it would actually feel. And let me tell you, the MP4/4 feels as beautiful as you'd imagine. The sound of its Honda V6 turbo is as stunning as it was in reality and the cockpit is modeled to perfection. Immediately, you can relate to this God of an F1 car. I always enjoy comparing the speed of the virtual car to the speed of a modern racecar that I have actually driven. In this case, the MP4/4 is quite similar to last year's IndyCar. For a car that raced in 1988 to compare with a 2011 IndyCar in straight-line speed is pretty impressive. The grip of the car, however, is less. Even though the McLaren had monstrous slick tires, far bigger than what we use today, the aerodynamic efficiency is far less. So for outright lap speed, the MP4/4 would be a lot slower than a modern F1 car and also a good chunk slower than a modern IndyCar. But I don't care about that, because the car feels natural and raw. It feels like you have to work as the driver, manhandling its furious nature. This is rather unlike modern F1 cars that have so much technology that drivers often become puppets in an engineer's play. That is one of the reasons I have always loved IndyCar as, in the name of cost cutting, these highly expensive engineering masterpieces are not allowed, making the cars drive quite similar to the F1 cars of years' past. On the game, I was really impressed with the physics and handling of the car on cold tires. It was treacherous — which is exactly how it should be. You have to work the car hard to generate tire temperature. As heat builds gradually over the first couple of laps, you can begin to feel the car come to life. It's like waking a bear from hibernation. Not that I have ever done that, of course, but I imagine he would be rather groggy for the first few minutes, before he became pissed that you had disturbed him and tried to tear your face off. When the car is up to speed, the balance is near-perfect — unsurprising for a car as dominant as the MP4/4 was. You can drive into the turns mesmerizingly hard and the back end slides in the most beautifully controllable way. That's what driving is all about, and why I miss the days of Gilles Villeneuve battling Rene Arnoux in 1979 at Dijon (if you haven't seen it, Google it. Now) and Senna's onboard pole lap at Monaco in 1988, piloting the same MP4/4 I'm virtually driving on Simraceway. It's like the drivers were wrestling Jaws. Some were beaten and eaten alive, but the best managed to contain the beast and drive this machine in a way that almost looked elegant. I feel this even in the game. I fly around the racetrack trying to obtain the right balance of aggression and precision, so I too can feel like I could turn Mike Tyson into a ballroom dancer. Genuinely, it was a lot of fun. I have driven many open-wheel cars around the world and I know how they should feel. I have even driven a Lotus F1 car from 1991, so it's pretty easy for me to tell if the game is in the ballpark or not. And it definitely is. To me, the MP4/4 is the best Formula One car of all time, driven by the best driver of all time. While I might not have driven the actual car, I can at least say I have a good idea as to how it might feel. Now, if I can just get McLaren to give me a shot in the real thing, then (in the name of thorough journalism) this story will be complete. I'll make a few calls and tell them who I am. Pretty sure it will be fine. Hello, is this McLaren? Are you there? Anyone? They must be busy. I'll try again later.